Stamp presents on cream card stock using black pigment ink. Emboss using silver, green, and gold powders. Cut out and attach to strip of red card stock. 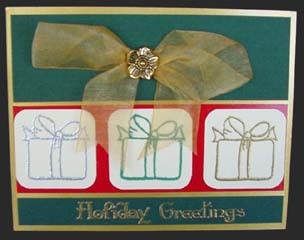 Stamp Holiday Greetings on green card stock with gold pigment ink. Emboss with gold powder. Cut green card stock in strips, as shown, and align on top and bottom of red strip leaving 1/8″ to show gold card. Attach bow and gold button on green card and layer all on gold card as shown.